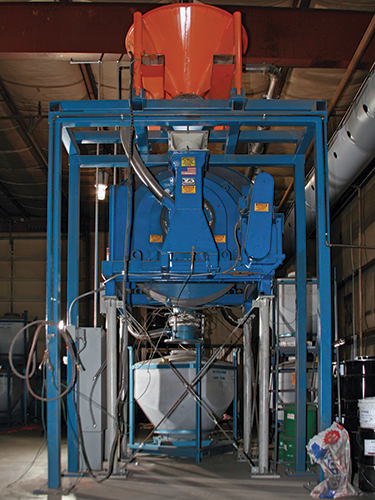 Bringing powdered metal blending in-house, rotary-style - Munson Machinery, Inc.
INDIANAPOLIS, IN  When processing powdered metal compounds for products such as gyro rotors, flywheels, counterbalances, boring bars and grinding quills, the proportion of powdered metal ingredients must be precise, and the distribution of those ingredients 100 percent uniform. Mi-Tech Metals, Indianapolis, IN, has been manufacturing products from high-density tungsten-based alloys for more than 26 years, during which the powdered metal industry has become highly competitive. With all players executing essentially the same procedures, success can depend on improvements in efficiency. For Mi-Tech, one of those improvements involved switching from the purchasing of blended metal powders to buying raw powders for in-house blending. "As we've grown," says Ross Stahl, engineering manager for Mi-Tech, "our volume has increased. Sheer economics dictated that we blend our own tungsten-based alloys." Until 2001, Mi-Tech blended small quantities of powder, typically 200 to 500 lb (90 to 225 kg), in small tumbler mixers. 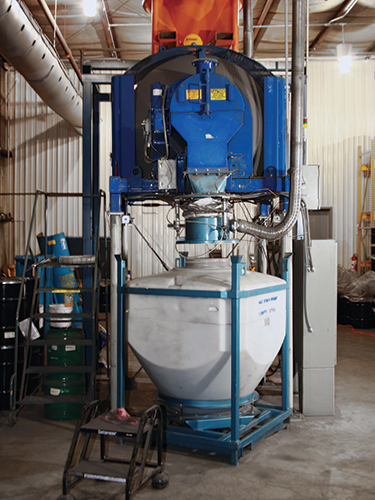 For the upgrade, Mi-Tech engineers researched different types of production-scale blenders, with emphasis on their ability to produce homogeneous blends rapidly with no segregation upon discharge, to evacuate the batch with no residual material, and to handle exceptionally heavy materials with bulk densities over 200 lbs/cu ft (3.2 gm/cc). Stahl said, "After researching several companies, we visited Munson Machinery, Utica, NY, spending two days in the laboratory to perform compositional tests at different mixing intervals to prove out blend consistency. We also tested for cross-contamination because we process 15 to 20 different blends, and it's critical that the equipment be easy to clean thoroughly, which we found it to be," he said. Mi-Tech purchased two of Munson's model 700-THX-15-MS rotary batch mixers, each of which can handle 5500-lb (2500-kg) batches of the company's powdered metal compositions. Raw powder ingredients are weighed in floor hoppers equipped with load cells, and moved pneumatically into surge hoppers positioned above each blender. When an operator initiates a blending cycle, a surge hopper valve opens to discharge accumulated batch ingredients into the rotating Munson blender. Baffles in the rotating mixing chamber continually lift and direct material toward the discharge spout that is equipped with a head assembly designed specifically for Mi-Tech. "While the powder will discharge from the blender on its own," says Stahl, "we needed a way of controlling how it is discharged into the intermediate bulk containers we use." Once filled with blended powder, the bulk containers are moved using tow motors. The company uses about 20 of these intermediate bulk containers for temporary storage of blended powders while the properties of the blends are verified, a process that can take several days to a week. Thorough blending is crucial. "There are industry standards for the various composite heavy metals," adds Stahl. "Our powder has to be within specifications for tungsten, nickel, iron and so on, for each of the different materials. The mixing must be uniform. Otherwise the pressed parts won't have a consistent chemical analysis, which will affect the final part's properties as well as the sintering processes. To ensure the chemistry is right, we test after blending, taking samples to verify composition and to produce test parts for analysis of mechanical properties." "During the blending cycle the material is in motion 100 percent of the time, and because we know how homogenously the blenders mix the powders, and that static blends will not separate during storage, separation of blended ingredients is not a concern," he explains. Once properties are verified, each 5500-lb (2500-kg) batch is typically metered from bulk containers into smaller barrels for transportation to various compaction processes. "It's not efficient to constantly change over powders," says Stahl. The blended powders are compressed into thousands of different shapes. Compacted powder not yet sintered is termed "green," and is subject to breakage if improperly handled. Broken pieces are loaded into a Pin Mill, also from Munson, reducing them into powders which are screened and blended with virgin powders up to certain percentages, depending on the blend being produced. "This is all part of being efficient," said Stahl. "By using green powders, we prevent a big buildup of powder that cannot be used." Following compaction, green parts are sintered, and then machined to produce the final part. The rotary mixers consists of a horizontal, rotating drum that has a stationary inlet at one end and a stationary outlet with a discharge gate at the other. The mixing vessel, which has no internal moving parts, is supported by two robust trunion rings, which ride on heavy-duty alloy roller assemblies. Material is loaded through the inlet chute while the drum is rotating. 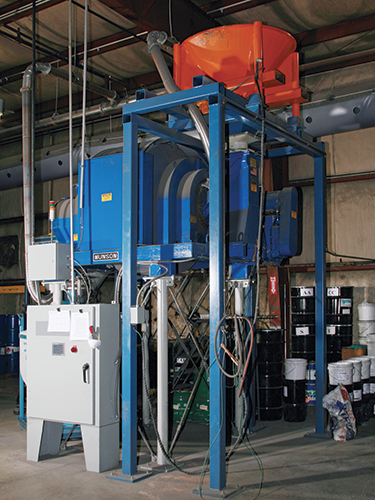 According to Munson, internal mixing flights tumble and fold the batch materials in a multi-directional manner, achieving 100 percent batch uniformity in less than three minutes. The flights also serve to elevate the material as the drum rotates, directing material to the discharge gate for total evacuation of the batch with no segregation upon discharge. Unlike stationary horizontal blenders with mixing blades that are forced through the material, the rotary-style blender uses a low horsepower motor, and imparts little to no energy into the material as it gently tumbles, preventing product degradation. Interior mixing flights were specified with large radius, ground and polished weldments, eliminating areas where material could lodge. "We rarely have to clean out between mixes," says Stahl. "Periodically, we'll open a door on the mixer, pass air through it and turn on the dust collector to the mixer. If there's any buildup, it cleans quickly. We do this as more of a preventative maintenance function than out of necessity." High capacity of the equipment enables Mi-Tech to purchase 38 to 44 tons of raw material per month at reduced cost, and blend it in one shift with one operator, minimizing operating costs. "In addition," says Stahl, "blending such large batches reduces the cost and delay associated with quality verification procedures. From this size batch, we will produce 100 or so different orders. In some cases, we will produce a quantity of boring bars, which we will stock for sale. In other cases, we will make one-of-a-kind, made-to-order items." While Stahl won't reveal too many details of the productivity improvements he's realized with the new equipment, he does say it keeps Mi-Tech competitive in a market where efficiency improvements are crucial to success. 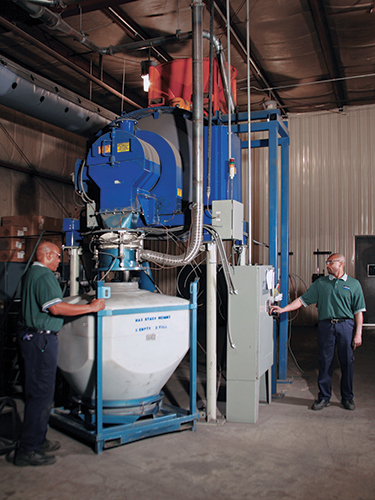 Munson rotary batch mixer processes 5500-lb (2500-kg) batches of powdered metal components. Raw powder ingredients enter from surge hopper above and blended powders discharge into intermediate bulk container below. 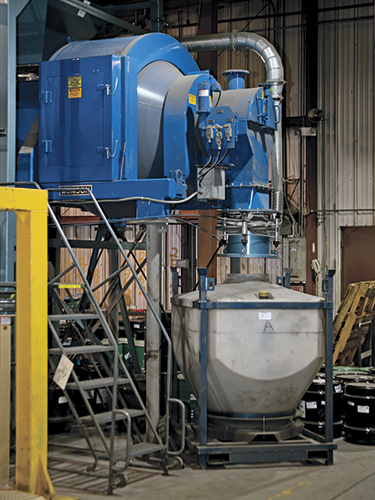 Blended powders are discharged into intermediate bulk container before they are verified, then compacted to form "green" parts, ready for sintering and subsequent machining. 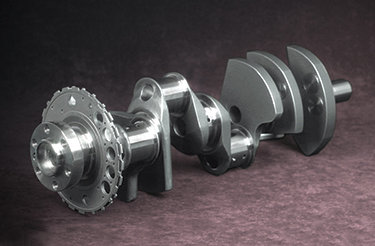 Mi-Tech Metals manufactures powdered metal products from tungsten-based alloys such as this crankshaft.